Up to this point, I've talked about a few of the inspirations for my home campaign, the World of Samoth - specifically mentioning The Known World, The World of Conan, and real-world History. Clicking on the "Inspirations" will also pull up a host of other blog posts related to things that inspired the shape of my campaign world. All of those, and more, had a big impact on the "flavor" of my campaign world, but one thing in particular had very specific impact on the way that I organized my world, the type of information I chose to develop and portray, and the aesthetics of how the information was presented: the 1983 World of Greyhawk boxed set from TSR. Yes, I know that the earlier 1980 "folio" version of the setting is the darling of the OSR community, but I never had that version, and I've still never seen it. 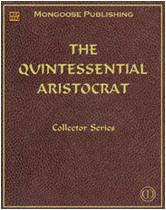 The boxed set is the one I grew up with, and the one that I used as a model for my campaign world's earliest iterations. 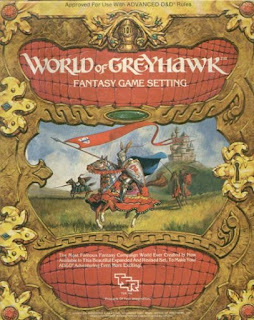 The reason I call my campaign the World of Samoth, and not just Samoth, is because of the World of Greyhawk. I won't get too much into the actual contents of the World of Greyhawk boxed set - there are other sites that do that, and sooner or later I suspect that it will be available as a PDF from WotC now that they're beginning to sell PDFs of all of their old out-of-print products again. What I will say is that Gary Gygax had very specific ideas on what constituted "world-building," for including way more detail that was needed, and also for hanging on to his war gaming roots by including information that would be helpful if one were running a miniatures war game but which would likely not be necessary at all for one playing a role-playing game. notebook, with calligraphy and hand-written notes. 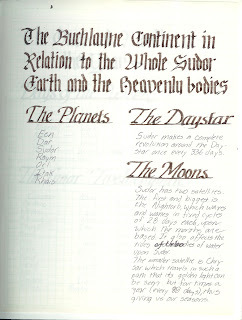 To illustrate these points, I'll first cover the concept of solar systems, planets, and so forth. This information was included, with some level of detail, in the boxed set, and this was really the first time I'd ever seen anything like this presented in this manner before. I'd read books about Narnia, Middle Earth, Conan's Hyboria, etc., but it never occurred to me in all of those readings to think about other planets in the solar system, or how often those particular worlds orbitted around their sun, or how many moons they had. Even having seen Star Wars and its multitude of planets never caused me to rethink how the fantasy lands I'd read about as a kid dealt with these subjects. Anyway, I dutifully took notes and included this information in my own campaign world, even copying the presentation style, and verbiage, of Gygax. I've included scans of some of these old notes, written in graph paper in a combination of calligraphy and regular ballpoint pen. The thing is... it's never come up in my game. Ever. 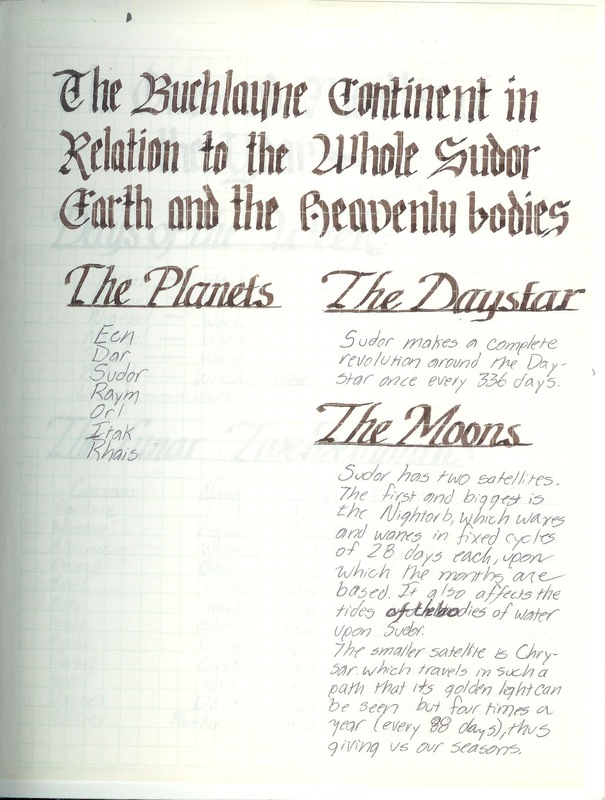 I've been running this campaign for about 12 years now, and never once have the various other planets come into play, nor the question of which of Samoth's two moons is waxing or waning, etc. At one point, I attempted to force-graft a very elaborate astrology system into my game, and allow spellcasters to take feats (this was in 3.5 days) that would allow their magic to increase in power when certain astrological things were happening, but also negatively affecting them at other times. I ultimately discarded this because I realized that it was way too much record keeping, and ultimately, I could tell that my players just wouldn't care. That's not a bad thing - I'm not "blaming them." It's just really too much detail than what is needed for the game. for the World of Samoth. Circa 1986. 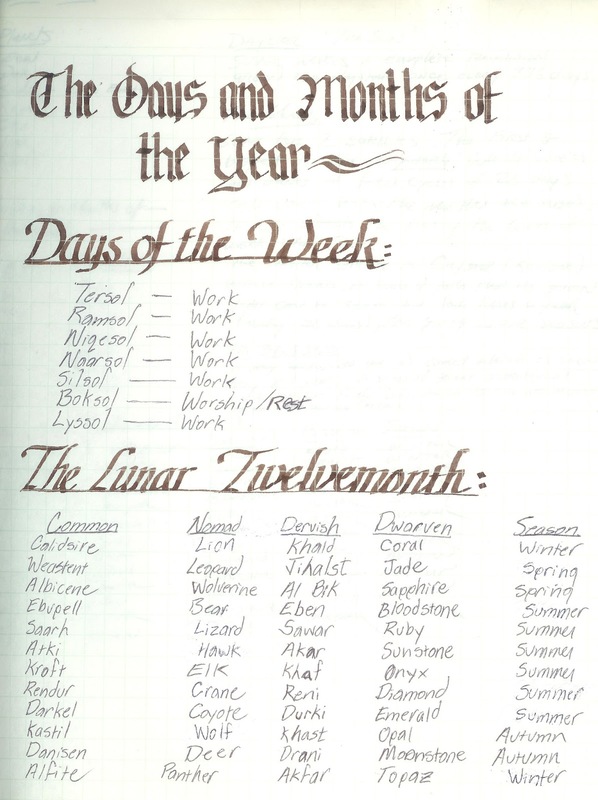 Another example is a pretty elaborate calendar system I developed, again patterned on the one Gary put in World in Greyhawk. 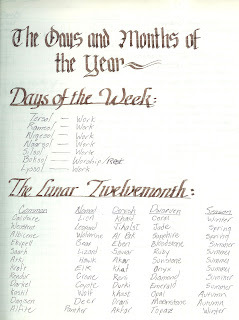 And, just like Gary, since he included the names of different months for various different cultures, I did the same. And, again, this has never come up in play. The only time the days of the week get mentioned, at all, is when I get around to writing the recaps of our various sessions and I go back and see what day of the week it would've been and note the date on the recap. I do track seasons and things like that, so that I can appropriately describe the weather, but other than that, it's something that seems cool at the time, and seems to really add a level of detail to a world setting, but ultimately does not have a huge impact during game play. Speaking of weather, this is an area of "adding more detail than is needed." Gary had ported over a "Weather Generation System" that someone had submitted to Dragon magazine and dropped it into the World of Greyhawk boxed set. Once I saw this in the guide, I started to panic slightly. My young 16-year old self thought, "Holy crap... he's talking about weather and average monthly temperatures and amount of rainfall... this stuff has to be real. If I try to fake this, someone's going to call me out and everybody is going to hate my world and think I don't know what I'm doing." At this point, since I wasn't actively playing D&D at the time, world-building for me was really done with an eye toward eventual publication, so I wanted everything to be "just right." I started digging through my parents' set of old World Book Encyclopedias from 1962 and trying to figure out the average temperature and weather patterns of various areas of the world, and then applying that to my campaign setting. The result was a weather table that looked almost identical to the one from the World of Greyhawk. More importantly, it's never seen use in any of my games. Ever. Regarding the point on Gary's war gaming roots, when he wrote up the short synopses on each country in the World, there were two main things that he covered: the name, class, and level of the ruler (so you could stat them out, in case you wanted to fight them, I guess), and also a very detailed analysis of the country's military forces (the number of "heavy foot" and the weapons they carried, etc.). Again, I figured "this is how you build a fantasy campaign world" and I went on to detail the numbers, armor, weapons, and type of the military forces of each country in my world, and went so far as to "mix things up" by giving certain countries soldiers that specialized in wielding the glaive-guisarme, for example, or the voulge, rather than just a plain old halberd or spear or whatever. This kind of stuff was important to me. Gary included it, so it's got to be in there. Guess how often it's come up in my games? There is just so much stuff in these two little booklets in the World of Greyhawk setting, and every detail of it was absorbed by me and then included in my campaign world. I have notes on the types of clothing worn by the various different human races, the types of instruments most common among the dwarves of different parts of my world, elaborate descriptions of the "death rituals" of four main races in just one specific country, the migration patterns of different races of humans across the main continents... all of this stuff just seemed to be necessary and integral to the building of a cohesive fantasy world. No detail could be skipped over, or the world wouldn't feel "real." And, you know what? Despite 99% of this stuff never actually seeing use in game play, I do think it has affected how much I know about my campaign world. That might seem like an odd statement, since I just made the world up, so obviously I know everything about it. What I mean, though, is that because I spent so much time developing these details over the past 25+ years, they creep in at times what I probably don't expect it, and maybe don't even realize it, and I hope make the world a richer place to adventure in for my players. 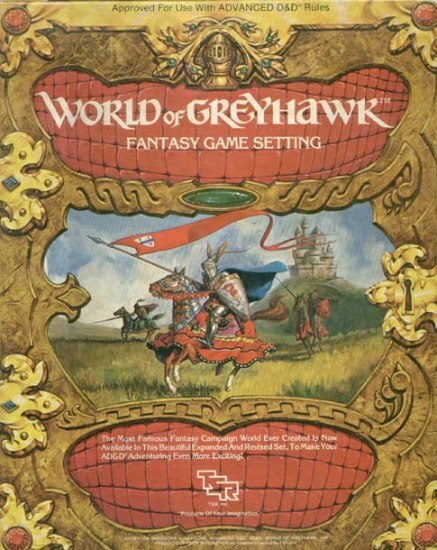 And, for that, I will always be grateful that I snagged a used copy of the World of Greyhawk boxed setting from one of my buddies when I was a kid. But the point is that *you* know it. It means that when things happen, it's because of a background of events that you probably don't know that well, but you know it well enough to keep track of it in rough terms. You can create a continuing story without miracle making. Or, if you do have something that *just isn't right*, somebody who knows the world will look at it and say, "That isn't right." You don't have to tell them. Hey - thanks for checking out my blog, and for commenting. I appreciate it. Thanks again for stopping by - I hope you stick around! Hah. In my first 3rd Edition game I actually generated the weather conditions for an entire year in advance. I think it wound up mattering twice, once when they had a random encounter in heavy snow and other when they had a planned encounter in flash flood conditions. Other than that? A waste of time. Wow - nicely done. But, like you said, sometimes it seems like "a waste of time." I basically just have a calendar with standard 12 months and four seasons (different names, of course), and I do keep rough track of what time of year it is, so I can throw in things like you mentioned above - heavy storm storms, rain, oppressive heat, etc. I mainly just do it off the cuff, based on what time of year it is, just to add some flavor to the game. It rarely has any in-game mechanical significance except in the case of tracking, etc. Decision Decisions Tuesday: "Bad Guys"